It's not hard to find something you really like at Wilkins and Olander! So read on, visit their website, and when in Door County, make sure to stop in at one of their convenient locations in either Sturgeon Bay or Fish Creek - you will love what you find! Wilkins and Olander opened their doors in 1990 in Downtown Sturgeon Bay and quickly became one of the anchors of the Historic Shopping District. As a former buyer for Marshall Field’s, owner Carol Overland and step daughter Dawn Fischer are on a constant hunt for new clothing and accessory lines that reflect the latest fashion trends. Wilkins and Olander also carries the hottest lines, like "She Beads(tm)", hand rolled clay beaded jewelry, where you can add beads to a bracelet or necklace. Colorful, fun and fashionable, "she beads" is one of the hottest lines! Speaking of hot lines, you will find the latest rage, "Switch Flops(tm)!" "Switch Flops(tm) offers a line of flip-flop bottoms, but they also let you change the colors and designs on your "switches" - the bands that go between your toes and up the side of your feet. "Switches" are offered in an almost endless variety - so you can, as they say, "change your look and not your sole!" Very cool and very hot! What a terrific idea! Huge selection! 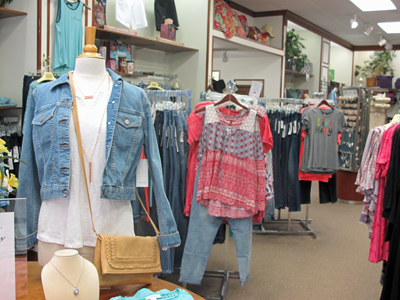 For you ladies, Wilkins and Olander offers a large selection of updated sportswear lines including Tribal, Willow, Wild Palms, Karen Kane and Nomadic Traders. You will also find many separate items like Jag and French Dressing jeans, Cactus and Zashi printed tops and Splendor Sweaters, just to highlight a few. And really, if you love sweaters – stop in here – they are known for having super sweaters – perfect for a fall or winter day, or a chilly summer evening! You want hot accessories? 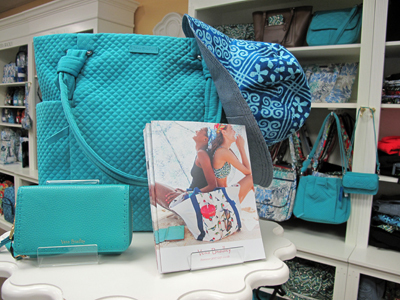 You’ll find the largest selection of Vera Bradley bags we’ve ever seen. And in 2014, they have added an entirely new display section for their Vera Bradley Collection! They have earned the Vera Bradley gold dealer status for excellence in product selection and service. They also have an entire case full of Pandora Charms, Beads, and Bracelets. Selected as a Pandora Gold Dealer, they carry the entire collection of charms, bracelets, necklaces and earrings. They also have a huge selection of Patricia Locke, Judith Jack and Brighton jewelry (very cool earrings, bracelets and more – my family has purchased accessories here as well). When you head up the peninsula, don’t forget to stop in Wilkins and Olander’s Fish Creek shop (located right in the heart of downtown in the Founders Square shops). You will find the same great women’s selections in the quaint, historic cottage setting that Fish Creek is known for. Before you visit, take a quick preview of their shop by visiting their website, www.wilkinsandolander.com. They pride themselves on shipping the items featured on their site within 24 hours. The Wilkins and Olander staff is consistently courteous and very helpful! We like these stores and shop here often. We always make it a point to stop in and see what's new - these are two of the coolest clothing and accessory shops in Door County. In business since 1990, they have lots of experience at this! Stop in - you'll find something you will treasure. Make sure to give a nice pat on the head to Hattie and Leena, the W&O store dogs! And please tell them at Wilkins and Olander that DoorCountyNavigator.com sent you!